From Off-Broadway comes this astonishing charmer of a play, based upon the semi-autobiographical final work of three-time Pulitzer Prize–winning icon of American letters, Thornton Wilder. A dramatic comedy in two acts, Theophilus North was created for seven actors (4M, 3W) playing multiple roles. However, with flexible casting it allows parts for over twenty actors, for non-professional groups that wish to find properties to accommodate larger casting needs. 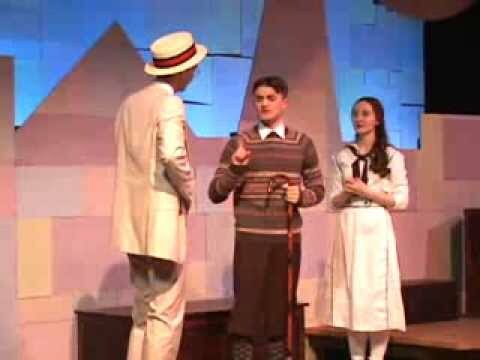 Theophilus North can be easily produced with minimal sets, properties and costumes. "Hope pulses so strongly through Theophilus North... Burnett injects his script with cosmic scope... IMAGINATIVE, FORCEFUL THEATER...Charming and breathtaking all at once... In the spirit of Wilder and with a dramatic vigor all its own, the play turns large-hearted living into art." "Undaunted, [it] evokes... tender, unforced humanity... Rich in dry humor, and in Wilder's... philosophy that the cosmic permeates the quotidian... Gently funny, spryly wise..."
"Charming... Captures Wilder's spirit of genial humor and tempered optimism... Ignites sparks of surprisingly deep emotion." "Excavates the Wilder play buried in the novel.... This Theophilus North is unmistakably a cousin of Our Town... There are muscles rippling under the play's rose-scented skin." "Five stars... Purely sparkles with intelligence, wit and humanity... This is a play both for the head and the heart." "Beautiful and intelligent... A mixture of Wilderesque sobriety and esprit. The late author would undoubtedly have tipped his boater..."
• License the play for four or more performances, and at your request through Samuel French, playwright Matthew Burnett will agree to a free one-hour Skype Q&A with you and your department/company. • When you purchase plays from Samuel French for production purposes, you may request copies autographed by the playwright, at no additional charge. • At your request from Samuel French, a free Theophilus North Study Guide introducing your students to the world of the play is available. Setting: The play is set in around Newport, Rhode Island during the summer of 1926. Sets and properties can be made as simple or mimed as desired. Simple Jazz Age, 1926 period costumes are desired. WOMAN 3 - 50s, plays Theophilus's mother; a sweet and simple Irish nurse; and a doyenne of the servant class. All Men and Women also play various locations and objects, which speak for themselves. Doubling/tripling roles. Flexible casting allows for larger cast size, when desired. Theophilus North received its World Premiere co-production by Arena Stage in Washington, DC, and Geva Theater in Rochester, NY — for which it received a Helen Hayes/Charles MacArthur Award nomination as Outstanding New Play or Musical of the Year. It has since been produced Off-Broadway at the Harold Clurman Theater, by the Drama Desk and OBIE Award–winning Keen Company, and at regional theaters including Organic Theater Company (Chicago, IL), TheatreWorks (Palo Alto, CA), People’s Light and Theatre (Malvern, PA), and Dorset Theater Festival (Dorset, VT), as well as at numerous community, college and high school theaters. CLICK HERE to read more about Theophilus North from playwright, Matthew Burnett.